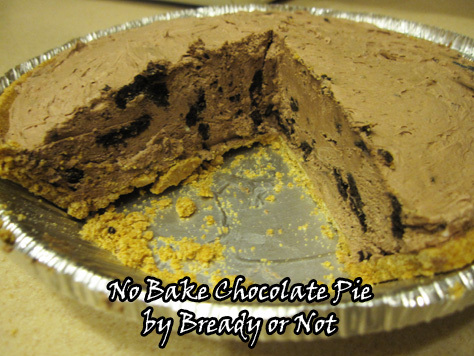 A simple, no-bake chocolate pie that’s easily customized to your liking. Heat chocolate and 2 tablespoons of the milk in a small saucepan over low heat, stirring frequently until chocolate is melted. Remove from heat. In a large bowl, beat together the sugar and cream cheese. Add the rest of the milk, and the cooled chocolate mixture. Beat until smooth. Fold in whipped topping and until the colors are blended. Add in the cookie chunks. Spoon into the premade cookie crust. Freeze the pie until firm, about 4 hours, or in the fridge overnight. Thaw at room temperature for a short while before serving, if need be. If desired, garnish with more Cool Whip, or chocolate or caramel drizzle. Store in the fridge.